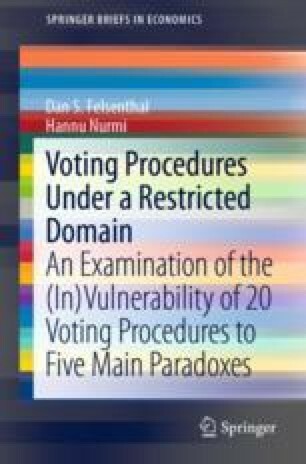 This chapter concludes the analysis of the 20 voting procedures in terms of 5 voting paradoxes in restricted domains characterized by the existence of a Condorcet winner which at the same time is elected by the procedure under investigation. The restricted domain provides a perspective to how much difference various profile types make in terms of the possibility of encountering a voting paradox. In this analysis we contrast the general (unrestricted) domain with one where the initial outcome is stable. We illustrate the problems involved in the choice of an appropriate procedure by discussing the recent proposal for electoral reform suggested by Maskin and Sen.